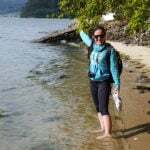 Home / Blog / 6 things that make the Via Francigena special! What makes the Via Francigena special? This is one of the world’s longest marked walking routes, covering 2,000 kilometres, that stretches all the way from Canterbury to Rome. We have carefully divided the route into 16 walking and cycling stages. Whether you are an adventurer, life long learner, history enthusiast, food lover or culture buff the different stages have something unique to offer. We have come up with 6 of our favourite things that make this walk so special. Discover the beauty of the lush countryside all the way from Canterbury to Rome. 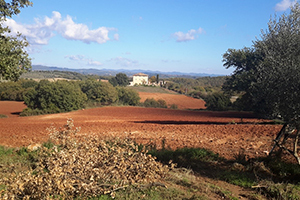 From the rocky terrain around the Great St.Bernards Pass to crossing over Tuscan hills, to admiring the contrasting colours; everything about the landscape along the Via Francigena is beautiful. The trails are carefully carved through some of Europe’s most enchanting scenery. The pathways on all of the sections in Italy are full of life with olive groves, peach trees and other fruits of the seasons all along the sideways. Getting lost and spending awhile in an olive grove isn’t a bad way to spend an afternoon. 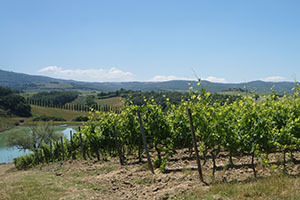 Another special point of the Via Francigena walk is the perfectly positioned resting points. During your walk you will find wooden benches neatly deposited right beside the most epic landscape views. The benches are a feature to remember as you will find them waiting for you at the end of a long morning stretch of the trail. Locals at some of the resting points leave out utensils and bottle openers that are available for Pilgrims to use for free. You can take this time to enjoy a tasty picnic and read over your walking notes for the journey ahead. One of the greatest things about walking holidays is the people you meet along the way. You will learn so much if you listen to the stories of other pilgrims and walkers. As well as time to reflect you have the opportunity to meet some wonderful characters. Soft spoken Swiss locals and charming Italians will grace your path as you continue from one village to the next. Once you stop by your first cafe to get your pilgrim stamp with “un caffè” you will be hooked. Due to the nature of the walk there is a common understanding between the local people and the pilgrims. So much so that there is no language barrier. The village locals know from your clothing and body language that you are on the Via Francigena journey, responding with water, great food and freshly brewed coffee. French bagettes, champagne, swiss cheese, oven baked pizza and the creamiest gelato – What more could any walker want on a trip? 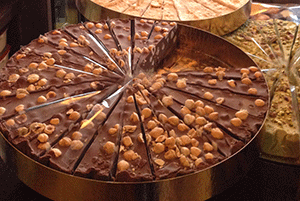 This is definitely a journey for food lovers of all kinds. As well as the delicious food you will find fresh water fountains and taps to keep you hydrated during your walk. Of course you will need to regularly top up your personal water bottle but it isn’t everyday that you get to sip fresh water from one of San Salvatore’s spouts in the ancient city of Lucca or one of the many Roman fountains also known Nasoni (big noses). No matter what section of the Via Francigena route you choose to do you will stumble across amazing historic sites and monuments. Some of our favourite stops include the UNESCO listed city of Siena, famous for its medieval architecture and the Etruscan tombs in the village of Sutri which you walk through on the stage from Viterbo to Rome. With Rome as the final stop there is a feast of historic and cultural gems to choose from and we would recommend spending an extra day here if you can to take in the sites. Due to the spiritual aspect of the walk you will encounter beautiful cathedrals and lovely small churches. 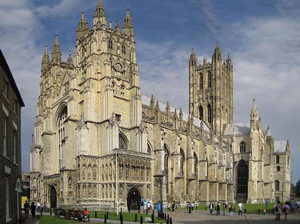 The full route starts with the 1000 year old UNESCO world heritage Canterbury Cathedral in England. In Reims you can pay a visit to the world famous Gothic Cathedral. As you pass through the small rural villages take time to explore some of the historic features and visit the churches. These are just a handful of things that you can discover when walking one of the 16 sections. For more reasons that make the Via Francigena special and information about our walking tours please contact our Travel Specialists.